Steam rooms are designed to expose the body to a high level of steam by installing generators that will pump steam throughout the room. 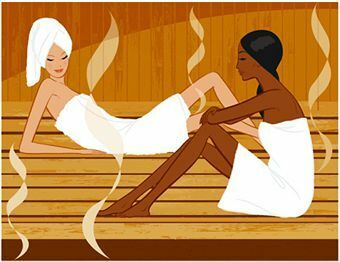 While a sauna creates low levels of moist heat, steam rooms promote 100 percent humidity with temperatures that can reach up to 110-140 degrees F. Steam rooms are known to provide a variety of health benefits which is increasing their popularity in commercial and home settings. Steam rooms have been used for therapeutic treatment since ancient times and doctors today continue to stand by these benefits. Those that plan to use a steam room are encouraged to continuously massage their bodies and sip water to encourage proper circulation and to prevent becoming dehydrated. Weight Loss. The high temperatures in a steam room will increase the body's metabolic rate, making it easier to lose weight. Users should not spend more than 20 minutes in a steam room in a given session. Once the session has been completed you may partake in a cold water bath to tighten the pores. Those that have diseases such as low blood pressure, cardiac problems, diabetes or any underlying conditions that affect the circulation should speak with their doctor before using a steam room. Remaining hydrated while using a steam room is vital. If at any time you feel faint or overheated, cease your session and leave the steam room. If you are using a public steam room there is a high risk of spreading disease-causing microbes and germs. Avoid using a steam room that is very crowded to lower this risk.